Lustrous, with a dusting of shimmer. Long wearing. Contains vitamins and moisture nourishment to keep lips conditioned. #170 ~ Glided Mauve ~ This color looks great on everyone from Brides to Mother of the Bride. A perfect blend of mauve and brown, this color should be a staple in every makeup bag. 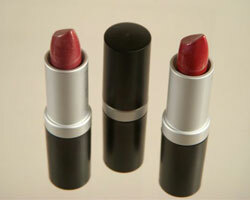 #206 ~ Berry, Berry, Rich ~ Every time you wear this believable rich berry shade, you will feel like a million bucks!